I had a small dinner party last night for a few friends I hadn't seen in a while. 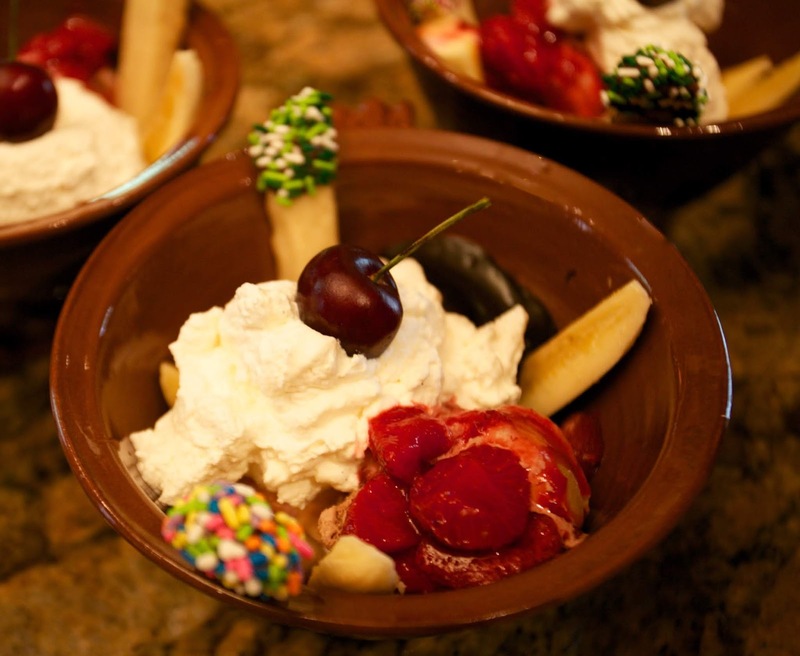 I surprised them with mini banana splits for dessert. They were thrilled and acted like little kids. 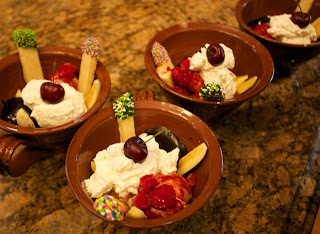 They hadn't had banana splits in many many years. 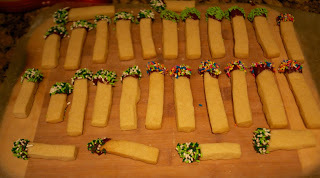 I made shortbread sticks dipped in chocolate and sprinkles to stick in them too. I made hot fudge sauce, caramel sauce and strawberry sauce with local strawberries. I placed banana wedges in the bowls, added small scoops of vanilla, chocolate and strawberry ice cream, then added candied walnuts, homemade vanilla whipped cream and fresh cherries. I made cedar planked salmon which I forgot to photograph and served it with Israeli couscous and spinach sauteed in ramp butter. 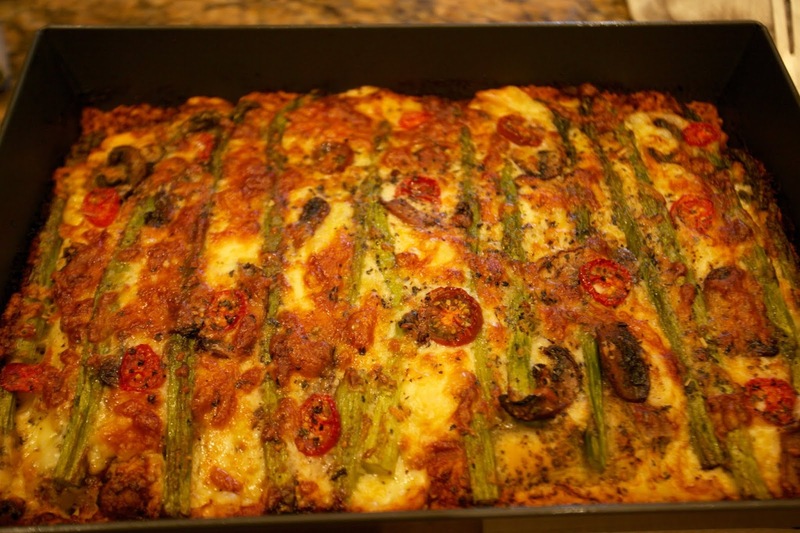 Since the meal was sort of simple, I didn't want to serve a bland bread so I created this version of Detroit pizza to serve on the side. It was such a hit! Instead of red sauce, I topped the dough with my first pesto of the season, some prosciutto and added cubes of Muenster, Fontina and Cantal cheeses. 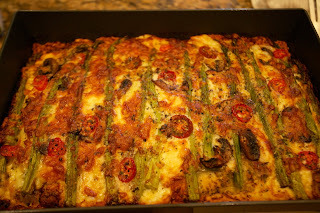 I laid roasted asparagus, sauteed mushrooms and cherry tomatoes on top of the cheese. I sprinkled grated Provolone on top and sprinkled it with some spices. 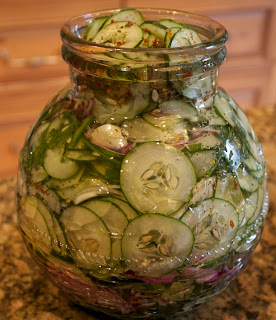 I will be making this often while fresh asparagus and local mushrooms are available. I split the dough and made 2 thinner pizzas. 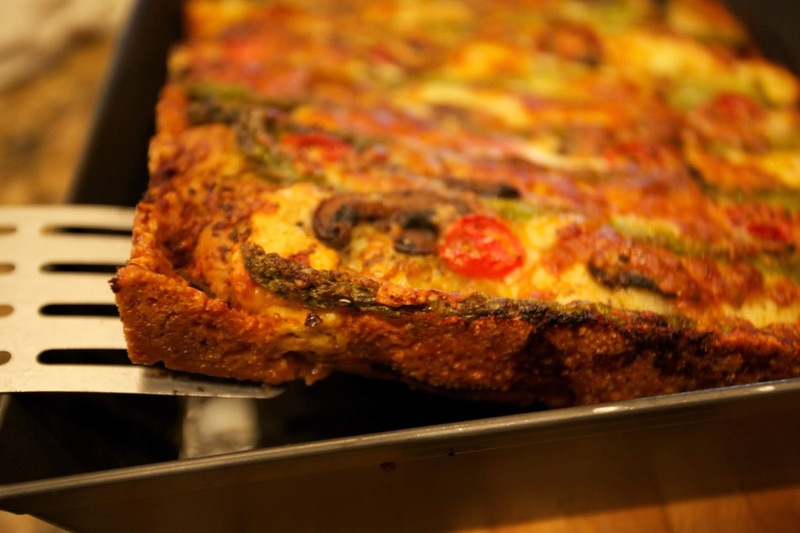 If you use the dough to make one, it will be thick like a traditional Detroit pizza. People fight over who gets the crispy cheese corners. I have been making this salad a lot lately. It's fresh and wonderful. Combine lemon juice, sugar, olive oil, poppy seeds, mustard, garlic, salt, and onion powder in a large bowl. Whisk well until dressing is completely combined. 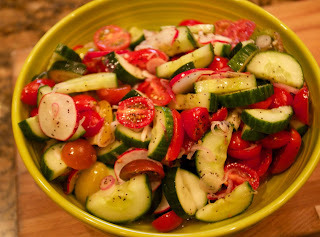 Add cucumbers, tomatoes, and onion to the bowl. Toss to combine. Chill until ready to serve. I double the dressing recipe. Winnie got groomed. She has fluffy pants. What a beautiful mean. Your friends were treated to a spectacular meal. A lot of thinking, effort and work. Winnie you are too cute. just a simple meal you say ! Oh my gosh,, that was amazing!! 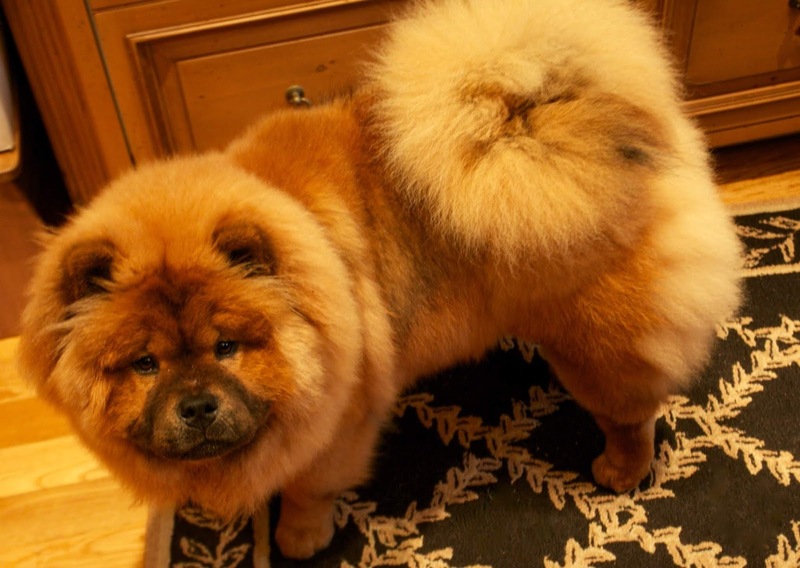 Winnie has the bone structure to carry off fluffy pants beautifully lol,,,,!! Winnie is growing so fast! She is beautiful. What a fantastic meal! 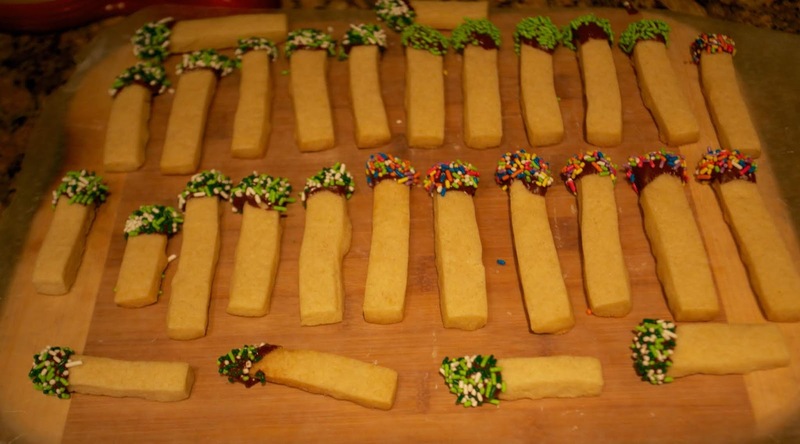 You are a marvelous hostess! An AWESOME meal and a floofy adorable puppy! Heaven! What a super idea! So fun! You know I had to think about it and it's been YEARS since I've had one too! Might just have to take care of that soon!! what a scrumptious meal and dessert. winnie looks sweet with fluffy pants. The meal was “sort of simple”? Are you kidding? 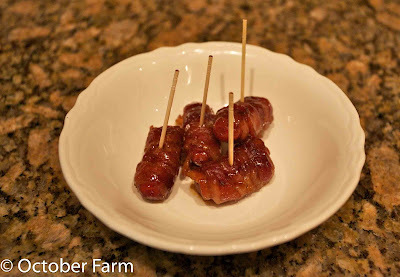 What a treat for your friends!!! I’d have taken just the sundae with all its lovingly homemade components ❤️.